Now things are getting good, you guys! We are about halfway through the story of Isabella and Noel, in The Tale of Two Mountains, and are to the point where we are learning secrets– terrible, dark, demented secrets– that will appear NOWHERE ELSE in The Eleventh Age Series. If you don’t read it here, on the site, you’re not going to ever find a hint of certain truths in the books. I’m so excited to have the chance to weave lore into my original series with tales on the website. It makes writing take that much longer, after all, I’m working on two books at once, but also such great fun, for me as an author, and for you as well. I think having the story bleed in other directions will add a certain intrigue I can’t impart writing in the perspective of the Eleventh Age tales. I mean it: This is so much fun! And I have every intention of continuing to branch off from the series with other lore tales online once Isabella and Noel are through. But anyway, I hope you enjoy this next chapter of The Tale of Two Mountains, as I lead you down dark paths you were never going to get to explore, otherwise. Whatever you do, don’t wander. The next day, Noel woke to the smell of cinnamon, ginger and nutmeg, filling his head with thoughts of dark winter mornings of his childhood home, which at least had been made better by his mother’s devotion in the kitchen. It was almost a pleasant memory, until the thought of his father caused the illness, which plagued him much of the previous day, to return. Noel opened his eyes to find Edward Frank silently cooking breakfast. He rarely saw the man during the day, being left alone most mornings, to sleep long as he liked. His breakfast was always waiting for him at the low table, never growing cold, no matter how late the hour, and Emanuel could be found dutifully standing guard at the door. That the old man was here today came as a dubious surprise. “She is greatly changed, Young Isabella,” the elder said, without turning from the steaming pan he tended. He had felt Noel wake. This was an understatement, Noel thought, rubbing his hands over his face, more to fight back the panic that began gnawing at his guts than to rid himself of the fog of sleep. Isabella’s presence was enough to be getting on with, as far as he was concerned, but as soon as she came out of her coma, Noel was keenly aware of just how greatly she had changed as a result of her experience with Moag. All her old levies were broken, and she was drowning in a sea of disillusionment. Even now he felt the pain of her regret burning in the tips of his fingers, and shook them out, squeezing and flexing them, though he knew it would not help. Noel left the woman’s hut the previous afternoon, thinking she would surely recover from her misery, with Harvey Frank there at her side. For his part, he sought refuge in the privacy of the old man’s hovel, to be alone while he had the chance, before someone came to find where he had gone to nurse his own disenchantment. He had prophecies of his own, and he had destroyed them. He had so little faith in the Prophecy of the Last Hope that he had never once considered he might have his own destiny to fulfill, a destiny that had been written down by someone like Master Edward Frank long ago. Surely others of his friends and brothers had prophecies that tied them to Hope as well. How much had he affected them? Had he, in coming there, put them all in harm’s way after more than ten thousand years of waiting for Hope? As he sat stewing yesterday, worrying over how much he had interfered with Fate’s path, Noel knew had no choice but to ask the Mardraim to look at the prophecies of the rest of the Nobles, no matter the outcome. He was not certain how much he wanted to know about the future or who he should ask about, but hundreds of Nobles had been born in the last thirty years, and more were being born daily. The Knowledge Keepers might have books for all of them, but Noel hardly knew the names of everyone, so It seemed only right to make certain his own friends, at least, were not affected. While he waited for the Mardraim to return home, he made a mental list of those he would ask about. It had grown to over fifty names by the time he finally set aside the chain of thistles he plucked from the tail of his garment, which he had strung together on one of the loose threads, pulled from its fabric. Noel fell also wondering if he should cut it down a bit. Edward Frank did not wake him when he arrived. “You were, erm… long with her?” Noel’s voice was harsh against his throat. “Until she grew weary and slept. Young Harvey and I spoke for some time, before he returned to the Felimi, as required,” the old man answered, as though he had heard Noel’s thoughts and felt the need to explain his absence. His grimace of concern at mention of the Felimi was not lost on Noel. Noel blew out a puff of air in answer to the stiffness of his back as he sat up, hurrying to pull himself loose from his sleeping bag. He brushed his hands through the top of his hair as he got from the ground, jogging the three steps across the room, not wanting to waste the invitation, since so much of his time there had been spent avoiding the obvious discussions out of deference to the rest of the Mdrai and the Felimi. Mist diffused the morning light, painting the world through the open doorway a subtle gray. As Noel passed, he saw Emanuel stood outside, the moisture that collected in his hair, dripping undeterred down his nose as he waited, still as a statue, by the garden post. Given the insistence of the Felimi at Fkat, Noel had expected Harvey Frank to be there, if anyone. He was thinking about this when he reached table and saw the chain of thistles he made, resting there near the teapot, a curious addition to the traditional setting. Noel’s stomach tightened. “We speak freely?” he asked as he sat cross-legged on the pillow across from the old man, indicating the boy outside with a kick of his thumb. The previous day’s Fkat was meant to get to the bottom of things, but Noel learned nothing new there of Moag, as Edward Frank requested, and he left before answering many of the questions the Mdrai and Felimi must still have about his journey to find their home. He certainly was not going to stick around to give them answers if he was not going to receive any answers in return. He was no great hand at diplomacy, that was certain, but he knew better than to lay all his cards on the table before everyone had placed their bets. Given his hasty exit, he expected he would be politely invited back to Fkat soon, but he hoped that by that time, he would be over the sick feeling he had ruined everything. That he was still under guard was not very reassuring. “Harvey?” he added, looking down at the chain of thistles sat between them, knowing the answer in his fingertips. Noel raised his brow. This was a strange request, considering Harvey was the Mardraim’s own grandson. Noel picked up the wooden spoon and cut into his breakfast, more to think than because he could stomach a meal, given his anxious state, but as he took that reluctant first bite, he was surprised to find the dessert Edward Frank made was much like bread pudding and tasted almost exactly as he remembered his mother serving for breakfast every Boxing Day, when he was a boy. “I… tell him… falsehood?” he asked, uncertain of his words. 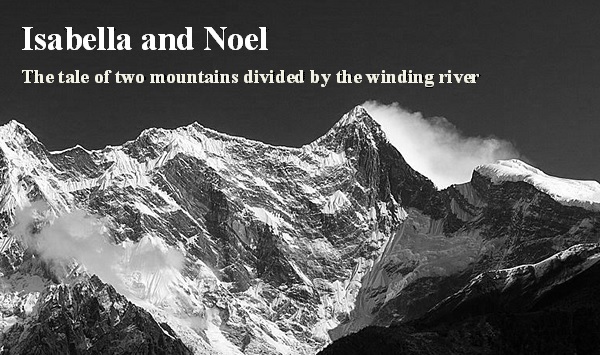 Noel leaned back slightly, the feeling this sort of intrigue was not normal in the mountain giving him pause. After a moment, he reached for the teapot and poured a bit into each of their cups, filling the air with the scent of fresh ginger. He wondered if it would not be better to leave family quarrels to the family. “Why?” he asked, returning the pot to its place on the table. Noel coughed, swallowing hard against his third bite as it caught in his throat. He might not be able to get answers about his friends, but at least everyone would know for certain if he had broken the Prophecy of the Last Hope of the Elves. Tomorrow there would be no doubt left of the extent of damage he wrought in coming to the mountain. He took a drink of his tea, guilt causing his jaws to tighten. At least it would be out in the open, and he would not have to fear it in any longer. As his stomach churned, he laid his spoon on his plate, quite finished with eating, and wiped his mouth. “A boy, born the day you landed in the gorge, who died the day you escaped Moag,” the Mardraim answered. “All those born in the mountain are prophesied, Young Noel. Our number is less than four and twenty thousand souls, all known to us, as our souls live countless lifetimes learning what we need in the service of Om. This child, whoever he was, had no prophecy. We knew this well before you came. Clearly, he was seeded in his mother’s womb in the traditional manner, however that he was born and died as your path to us unfolded was highly curious to me. Noel’s eyes widened, and he shook his head, trying to understand it all. A great deal had happened of which he was completely unaware, it seemed, and he expected his ignorance was by design. He was a stranger to them, and their lives had been sent into chaos because of him. He had no idea what the child’s birth or death could possibly have to do with him though. “You… seek changes,” he said, wondering what the old man had discovered. Noel took in a shaky breath and let it out. “All gone?” he asked weakly. Noel swallowed, wondering what else the old seer could reveal that might make some difference now. Noel had touched the Dreaming. If Edward Frank’s own prophecies had been affected, Noel rightly owed him whatever answers he might be able to give. That the elder had even a small hope there might be some means of reversing their fate, or fatelessness as it were, only cemented in his mind the idea that he had to do whatever he could to help. “The wanderer lives,” Noel hissed. Edward reached for his small, plainly decorated cup, hand trembling, and as he took a sip, Noel could tell by the look on his face that whatever the old man had done was terrible, perhaps even unforgivable, at least in his own eyes. “She suffered such anguish, Young Noel, and I believed that she had come to be in this state, as a result of saving your life,” he continued, setting his cup back on the table precisely as it was before, though hit clattered a bit before he let it go. “She was with the Felimi, in their care, for the worst of it. As soon as we knew she turned, we Mdrai went to the cloister to see what we might do to help her. Though it is a violation of the Mdonyatra to act against Om, to save a life, I believed we might save her and as consequence save Om itself, which was in danger, we thought, because of you. I intended to find a way to kill you while you were still inside Moag, and I told the Felimi as much. “Taking the life of another is the worst sort of crime, second only to saving one. If the Felimi allowed it, I would have entered Moag myself, to find you, to destroy you, so that you would release Young Isabella from whatever bond held the two of you together. Given what we were told of Moag, I likely would have been lost forever, but I was gladly willing to give myself as sacrifice. My hope was only to save Young Isabella and to restore Om. If the events that followed had not occurred as they did, I would have been sent into exile for this idea, but as it happened, the Mdrai were waiting for me at the entrance to Moag, all of us set on the same thought to murder you and save Isabella. “She saw me?” He had not expected this, but he supposed it only made sense, considering he had also seen her. “The story of Young Eri, a boy many years ago, who entered Moag and was lost to us forever. The Mardraim at the time, as well as one of the Felimi, who has never been reborn since, entered Moag to try to save him, and were also lost,” the elder explained. “You believe?” Noel scowled, hardly understanding how something like this might be possible when he did not understand prophecy to begin with. Noel breathed in long through his nose, as he pushed himself up from the ground to pace the small room, wondering if his own experience in Moag had been prophetic. He had believed someone was playing around in his head, bringing up old ghosts of his youth, tormenting him with the hateful words of his father. He did not see how this could be prophecy, when all of it had already happened in the past, but then there was his strange hallucination of Isabella Asan drowning in quicksand. Though it made no sense that she should appear there in that cavern so unexpectedly, he tried to rescue her and was forced to squeeze the life out of her to get her to safety, but when he knelt to breathe the life back into her, she was not some newly dead beauty who had just suffocated on the rising sand, but rather a mummified corpse, oozing from every orifice with the very sand that threatened to fill the cavern and kill Noel too. He grumbled at the memory, perfectly aware that soon thereafter he found himself actually breathing the life back into Isabella, parts of her rotting away, as though she had been dead for weeks, not minutes. Could it possibly be that he saw some strange prophecy from Moag as well? Noel gave a nervous groan and turned to pace again. “So much alike,” he whispered, balling his fists at his side. Noel stood staring dumbfounded at the old man, hand clutched at his side, fingertips vibrating with an agonizing numbness he could not ignore. He swallowed, shaking his head, not wanting to believe it, yet knowing that if this was prophecy, if they were truly going to consider the possibility that it was prophecy that Isabella saw inside Moag, then it was confirmation of a truth that had gnawed at him for days, with every curious stir of her in his hand. Isabella was in him. Somehow, she was truly there with him, in the tunnel where Moag waited for them. As he hurried to breathe the life back into her decaying corpse that day, she was there with him, trying to save herself. She had foreseen it, and he had somehow lived it, felt her passing through him with his breath, though a part of her remained trapped within him. Isabella had saved her own life, as prophesied. He shook his head wildly, gritting his teeth against the impossibility of it all, his mind grinding wickedly, in search of any other explanation, but there was none. She was there with him that very moment, a mocking buzz trapped in his fingertips, a furious burn pushing the hair back from his eyes. She was the quavering palm that pressed against the ache building in his forehead. Noel swallowed against the tightness in his throat. Frightened, he ran both of his shaking hands through his hair, gripping it momentarily as he pressed his lips together. He gave a single, slow nod.